Amazon’s biggest Great Indian Festival Sale kicks of today at 12PM noon, with Prime members getting an access to deals 12 hours prior to all customers. The sale consists of great deals on Samsung mobile phones such as Galaxy Note 8, Galaxy S9, Galaxy A8+, and more. Whether you’re planning to purchase Samsung's flagship or budget smartphone, the festival season is a pretty good time to consider making your move. 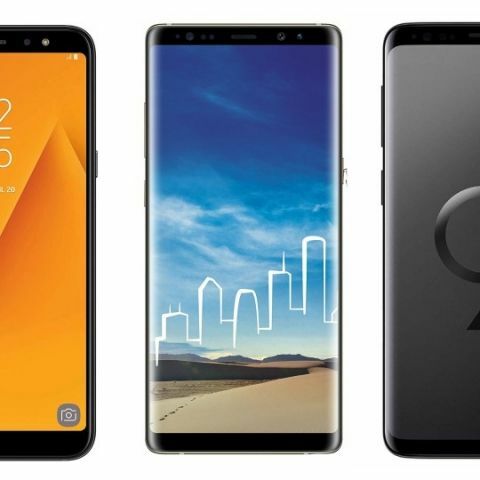 Amazon Great Indian Festival Sale is offering the best deals on the Samsung latest devices that includes Galaxy S9 and Galaxy Note 8 too. Let’s take a look at some of the top deals that platform has on Samsung smartphones today. The Samsung Galaxy S9 was launched in India in March 2018 with a price tag of Rs 57,900. The device is now available at a discounted price of Rs 42,990 on the Great Indian Festival Sale. Shoppers can also opt for 9-months No Cost EMI option on this purchase. The smartphone sports a 5.8-inch Super AMOLED display with a resolution of 1440 x 2960 pixels. The phone is powered by the Samsung Exynos 9810 octa-core processor. View deal here. The Samsung Galaxy Note 8 is now up for sale and available at a discounted price of Rs 43,999. Buyers will also get a free screen replacement, worth Rs 25,000. There is also a no-cost EMI option available for 9 months along with a guaranteed exchange price. The smartphone comes with a 5.8-inch display, which offers a resolution of 1440 x 2960 pixels. The device is backed by the Samsung Exynos 9810 octa-core processor, which is paired with 4GB RAM and 64GB internal memory. View deal here. The Samsung Galaxy A8 Plus comes with a 6-inch FHD+ Super AMOLED display with a resolution of 1080 x 2280 pixels. The device is powered by the Samsung Exynos 7870 octa-core processor, which is paired with 6GB RAM and 64GB internal storage. The device is available at a discounted price of Rs 23,990 along with an option for buyers to purchase the device on no-cost EMI. Customers will also get a free screen replacement worth Rs 10,000. View deal here. The Samsung Galaxy A6+ smartphone made its debut in India in May 2018 with a price tag of Rs 25,999. The smartphone has a 6-inch FHD+, which offers a resolution of 1080 x 2280 pixels. The device is backed by a Qualcomm Snapdragon 450 octa-core processor, which is paired with a 4GB RAM and 64GB internal storage. Buyers will get a 10% cashback on using SBI debit/credit cards along with an additional 10% cashback for making payment via a prepaid mode of payment. Not just that, if you have an old phone that you like to sell off, then Amazon is offering up to a Rs 3,000 off on exchange. View deal here. Alongside the Samsung Galaxy A6+, the Samsung A6 is also on sale and available at a discounted price of Rs 16,990. The smartphone comes with a 5.8-inch display with a resolution of 720 x 1440 pixels. The phone has a 16MP primary camera and a 16MP unit on the front as well. View deal here.